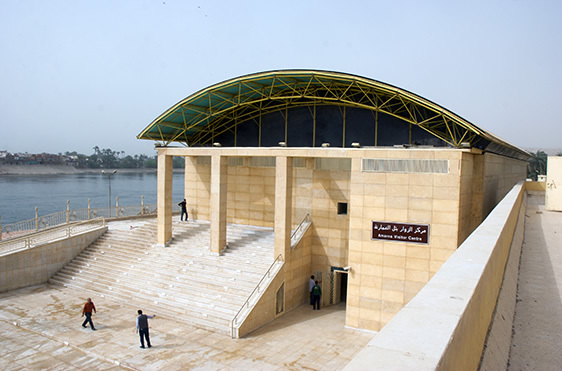 In early 2016, a Visitor Centre was opened on the banks of the Nile River in the village of El-Till. 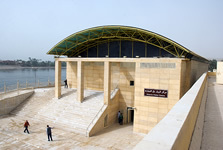 The Visitor Centre was a developed through collaboration between the Egyptian Ministry of Antiquities, Michael Mallinson Architects and the Amarna Project. The displays were designed largely by the Amarna Project and developed with the help of the Replica Department of the Ministry of Antiquities, Eastwood Cook and Andy Ingham Ltd. They take the form of Arabic–English information panels and replicas of monuments and objects from Amarna held in museums around the world. The centrepiece is a full-scale cut-away reconstruction of a house of an Amarna official. In a brief opening section, the reader will be asked to reflect on how they relate their own lives and beliefs to those of the people who lived at Amarna more than three thousand years ago. In order to set the scene of the Amarna period, the key players and events will be introduced: the royal family and officials who appear as historically recorded individuals; the religious reforms seen to characterise the period; and the events that shaped the close of the Eighteenth Dynasty. The ‘reforms’ of Akhenaten’s reign will be placed in context, allowing a balanced assessment of what, if anything, was truly revolutionary within it. This section explores the contrast between vision and reality. The city was created by a man with a religious vision, revealed to us through the Boundary Stelae and stone buildings that occupy the Amarna plain. He saw it as a series of temples, palaces and tombs. In the end, however, several tens of thousands of people moved there, most probably compelled by obligation or dependence. The king and the people occupied very different worlds, served by a very different allocation of resources. This contrast must have formed a basis for much of the complexity, the very social fabric, of life at the city. The city was a confluence of different materials and experiences. This section begins with an explanation of the properties of the mud, stone, gypsum and wood that formed the main building materials, to explore the experiences of colour, scale, vegetation, distance and travel within the city, lighting and smell. The theme of neighbourhood will introduce the essential character of Amarna in the study of urbanism, that of an extended village. It offers readers the chance to compare and contrast their own experiences of urban (or rural) life with that in the ancient city. The passage of 3350 years has left the site looking very different from how it once appeared. Temples and houses alike have been reduced to unprepossessing sandy mounds. Here, the reader will be introduced to the various processes that have left the site looking this way, be it deliberate destruction at the hands of Akhenaten’s successors, the impact of smaller-scale looting over many centuries, or the effects of natural weathering. It seeks to introduce some of the contemporary challenges of heritage management pertinent to and illustrated at the site, such as the need to strike a balance with the local community, and the growth of farmland and cemeteries vis-à-vis government responsibility for managing heritage. The question ‘What kind of Amarna do we want?’ will serve to highlight the fragile state of the site today and the responsibilities of current and future generations towards it. Knowledge of the past comes from the research of archaeologists and historians. Historians work with written sources that use the words and thoughts of the people of their time. Archaeologists uncover and interpret the material remains of the same people. In response to the questions commonly posed to archaeologists (How do you know where to dig? What is the best thing you have found? ), this section aims to explain and illustrate the different ways in which archaeologists work, the diverse categories of evidence they use, and how material remains reveal aspects of societies that the people of the time might not have recorded or been aware of. It seeks to leave people with an appreciation of the value of all kinds of evidence, not just intrinsically valuable antiquities, in reconstructing the past. The basic methods of survey and excavation, and the history thereof at Amarna, will be outlined. A series of case studies will introduce the work of specialist researchers in fields as diverse as ancient botany and insects, the composition of pottery fabrics and resin specimens: how were basketry, beer and glass made? The value of experimental archaeology will be demonstrated, and the importance of approaching sites with a broad temporal perspective will be highlighted through a discussion of the Old Kingdom, late Roman Period, and modern remains preserved at the site. Through the latter the contrast, and overlap, between ancient and ‘living’ traditions will be explored. The section will end with the important question of ancient intentions. This section seeks to explore a diverse range of themes, outlined below, but to present them as integrated components of the central theme of life at Amarna. Returning to the question of dependence in the Amarna suburbs, an exploration of the layout of housing areas reveals much about the relationships between officials and their neighbours. It reveals a society whose residents were largely locked in to the service of the state at some level. Through artefacts, tomb scenes and architectural emplacement such as granaries, this section examines what constituted ‘wealth’ in a pre-monetary society. What material possessions and surroundings were available to the city’s residents? How did wealth circulate, both within the city and beyond? The role of the temples in feeding the city is also explored. Amarna offers abundant, and well-contexted, evidence of craft production. Case studies of faience and glass production, pottery manufacture and stone work illustrate the relationship between human skill, tools and installations. This section aims to illustrate the variability of standards in craft production in objects intended both for the royal and private spheres. What did they eat and drink? How healthy were they? Analysis of plant and animal remains and architectural emplacements has done much to enlighten us on diet at Amarna, revealing evidence for the consumption of pigs, and the recipe of ancient beer. Excavation is shortly to commence on a recently identified lower-class cemetery, the skeletal remains of the Amarna residents themselves promising to add an important new dimension to the question of health and disease at the city. This section moves beyond the public face of Amarna to explore the inner worlds of the Amarna residents. An investigation of domestic space and household composition raises the question of how modern concepts of privacy relate to those at Amarna. It then moves into the realm of belief, asking how people coped with explaining existence and positioning themselves within its uncertainties. The Egyptians, like people everywhere, simultaneously occupied the twin worlds of daily routine and of the imagination. This theme will be briefly explored, taking in the pragmatic knowledge that people had of the wider world outside Egypt. In their imaginations spiritual and transcendental forces took a major place. Akhenaten followed a new interpretation of Egyptian religion, and invested substantial resources in the new cult. At the same time the people who populated Amarna arrived with minds shaped by the traditions of their upbringing. How did they behave in the new spiritual environment? An attempt will be made to measure the level of interest they expressed in Akhenaten’s ideas, and how many of their own ideas they retained. A brief closing section asks the reader how they position themselves and their society vis-à-vis Amarna and the society of its day.